This compact station is ideal for professional use. Soldering can be performed and adjusted from the control knob from 200°C – 450°C. Interchangeable iron plated tips are available to make the soldering station perfect for electronic and electric use. Adjustable temperature controlled soldering irons from 200 to 450 °C. Iron plated tip and stainless steel construction offer high durability. Soft grip handle design for maximum comfort and reduced slippage. 5 soldering iron tips can meet any different basic jobs. Lightweight and very convenient to use during the working time. 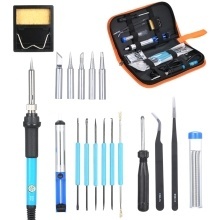 Perfect for hobbies, kits, radios, and electronics work. When the soldering iron is not used temporarily, soldering iron temperature should be adjusted to 200℃; if you’re not using soldering iron for long time, the power supply should be turned off. Please use a sponge to wipe clean after using, and re-tin to ensure it can be easily tinned on the soldering tips.